Product prices and availability are accurate as of 2019-04-19 18:55:07 UTC and are subject to change. Any price and availability information displayed on http://www.amazon.com/ at the time of purchase will apply to the purchase of this product. 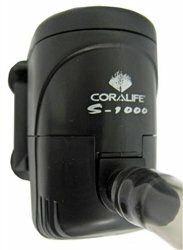 Replacement Coralife Size 29 BioCube Aquarium & Coralife Size 32 BioCube Replacement Pump. This BioCube Pump has the following markings on the pump: Coralife, S-1000, SUBMARINE WATER PUMP, 265 GPH, 0.36 A, 15W.